Well, it’s now time to put another year in the books. 2011 was great, although many thought it just flew by, including us. I’d first like to apologize for the site being somewhat slow…there hasn’t been a whole lot of action recently with the holidays and all. In the next few weeks, things will be picking back up. For now, I just want to look back on the past twelve months, and what trends/themes we’ve seen within both the consumer and aftermarket industry. First and foremost, I want to comment on some of the changes we’ve seen this year in the automotive marketplace. We’ve witnessed several new consumer cars introduced into the market, as well as some new concept cars taking shape. 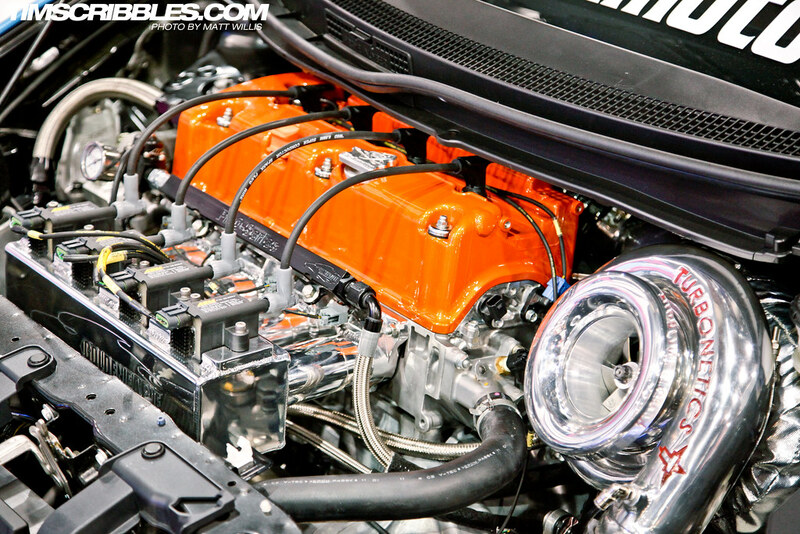 Many high-performance builds were unveiled too, most of them at the 2011 SEMA Show in Las Vegas, at which we were fortunate enough to attend. Some people, including myself, are looking at the New Year as a new opportunity to “finish” their own builds; others are looking to start their next and come back bigger and stronger. These are great signs; signs that we didn’t see a few years ago. This confidence is starting to show like a sunrise – slowly but surely spreading over the horizon. It’s good news for both automotive manufacturers and aftermarket vendors – but its better news for our country as a whole. Car sales have been up and down throughout 2011, but are currently on the rise according to consumer studies. Dealerships by my house that were once ready to close down are now close to having full lots again, and the salespeople are out trying to snake customers into taking inventory off the lot. The best sellers this year have been mid-size pickups. Forbes ranked the Ford F-150 and the Chevrolet Silverado #1 and #2, respectively, as the best selling vehicles of 2011. The Dodge Ram came in at #9. So how many new Priuses do you see on the road these days? I see a lot of Priuses – I try to keep most of them in my rear view mirror – but I don’t see many with dealer plates. Hybrid sales took a steep plunge this year, as many manufacturers increased the retail cost of Hybrid models trying to “ride the wave” of heavy demand. People became turned off by the up-front cost, and instead turned to more fuel efficient versions of traditional all-gasoline vehicles. Following the pickups, midsize sedans walked away with the greatest sales – specifically the Ford Fusion, Nissan Altima, Honda Accord and Hyundai Sonata – all of which were redesigned or received a facelift in 2011. The Ford F-150 holds its title as the #1 best-selling truck in the United States market for 34 years. It’s been a struggle for the industry this year, though. The American auto makers were financially unstable, put at risk by bad loans, a plummeting economy and lack of sales in 2010. The Japanese manufacturers were put at a stand-still after the great tsunami that struck east Japan back in March. Honda and Toyota, while many of their cars were assembled in America, relied on parts from overseas. European manufacturers, though seemingly unaffected by a looming financial crisis, still had poor sales in 2011. Perhaps the biggest success of the year were the Korean auto makers Hyundai and Kia – with their low-cost vehicles and generally acclaimed redesigned fleets – found the keys to success in a tough global economy. The great tsunami of 2011 did heavy damage to cars ready for shipping at cargo ports in Japan. Substantial inventory was lost for Japanese auto manufacturers. I do want to point out something – the resurgence going on in Detroit. Ford was the first to move – and the others have followed suit. If you look on Edmunds, or Forbes, or any other consumer watchdog – you’ll find that the Ford name currently holds around 17-18% of the market, just recently surpassing Chevrolet, GM’s biggest seller. Ford, though, has made all of this progress on their own dime – while GM and Chrysler borrowed from non-existent government “help out the private sector” fund – essentially a fraudulent check — earlier in the year. To me, that says a lot about the Ford Motor Company – they want legitimate business, just like they did back in the early 1900s. They just don’t care about themselves, they care about the economy as a whole. Their new-found enthusiasm and aggressive attitude is now making them known amongst a slew of dull voices. Don’t doubt it – they know what they are doing. After the arduous task of redesigning over half of their fleet in a matter of two years and deploying a new strategy called “The Way Forward” to market their lineup, Ford now finds themselves in the lead spot in U.S. sales. You might say, “Well, GM and Chrysler did the same thing!” Indeed they did, but this was after they declared bankruptcy and received their government “assistance” –meaning that when everything levels out, GM and Chrysler will still have a substantial debt on their shoulders, whereas Ford will not. But hell, that might not even be true, considering the way the government handles things today. It wouldn’t surprise me if that whole deal was just written off by our treasurer. Nobody can tell for sure yet, I guess – I just see some kind of yearning in Ford; the way they are getting their roots into every piece of the market share, and how quickly they are trying to revamp their lineup and the massive campaigns they’ve deployed worldwide to boost their sales. A result of this has put 5 Ford vehicles in the top vehicles of 2011. Compared to five or ten years ago, their fleet now looks very refined and refreshing. I can honestly say I like every one of their cars to some extent. In addition, every car in their lineup fits a particular purpose: the Fiesta is a small city car, the Focus in the standard compact, the Fusion is the midsize, the Mustang is the everlasting sports coupe, and the Taurus is the fullsize. They’ve rid of the Crown Victoria (although it will be in our hearts forever, haha) and the “Five Hundred”, both of which were unnecessary for their mainstream brand, especially sitting next to the Taurus. The next to be axed (by way of rumor) is supposed to be the Expedition and Flex models, leaving the mid-size Escape, the Edge crossover and the full-size Explorer to the SUV lineup. Another good move if it actually happens, as there is some serious redundancy there. In addition, Ford has redesigned the Taurus and Escape models for 2013, and plans to introduce a performance version of the Focus – the Focus ST – as well as a pending ST model of the Fiesta. Most of these next-generation Fords have dramatically improved fuel economy, thanks to new engines and management systems. The only other thing they should aim to revamp is the Mercury line, if they plan to keep it; with luxurious alternatives to the main Ford fleet. Otherwise, I truly have no complaints. They’re not really doing anything wrong. They’ve surely spent a lot of money getting all of this together – but I don’t think they’ll have any issues getting their ROI. The 2013 Ford Focus ST. The 2013 Ford Taurus SHO. Lets not forget, Ford is now involved in the FIA WRC, Grand-Am, Formula D, the NHRA, NASCAR and soon-to-be the WTCC racing circuits. Perhaps the best thing to come to Ford’s marketing division is the signatures of drivers Ken Block and Vaughn Gittin Jr., who have inspired a younger generation of enthusiasts – most of whom are interested in imports – to look in Ford’s direction. Formula Drift was once dominated by rear-wheel drive, small-box/big-turbo imports. A few years ago, Ford stepped in and introduced the Mustang into the circuit, and it’s been making smoke and fans ever since. It encourages a generation of die-hard import followers to go out and look at Mustangs for a change. Likewise, people see a Focus or Fiesta competing on a global rally circuit or doing gymkhana stunts, and they feel that same effect. With all this in mind, Ford gets my vote for the best manufacturer of 2011, and possibly beyond…only time will tell, though. 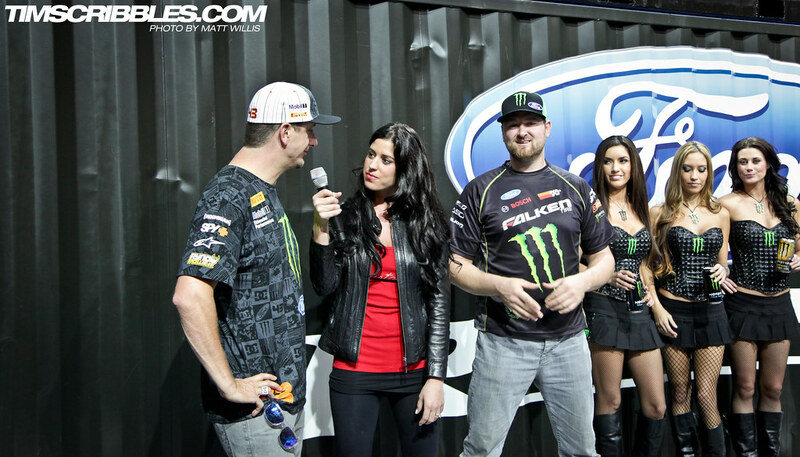 Ken Block and Vaughn Gittin, Jr., talking about the Octane Academy on the 2011 SEMA show floor. 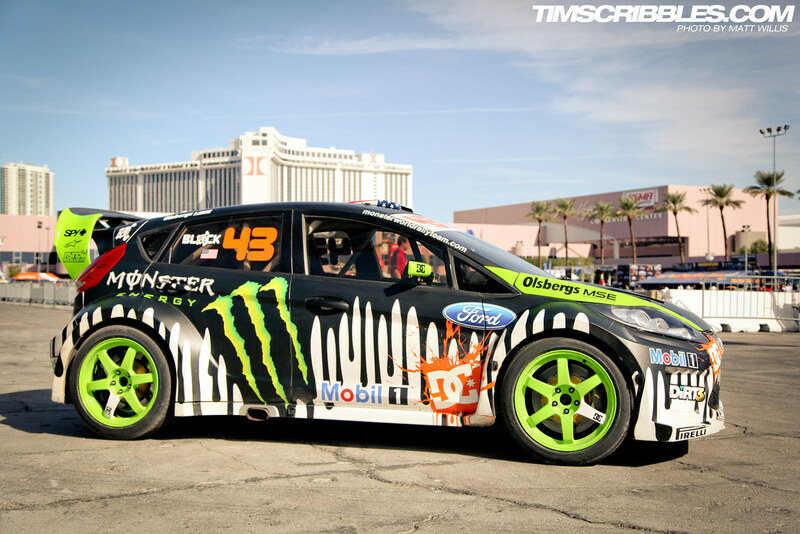 Ken Block’s Gymkhana Fiesta at the 2011 SEMA Show demonstration. On the contrary, there have been several stagnant brands in 2011. Among the worst sellers were Acura, Mitsubishi, Buick, Cadillac, GMC and Lincoln – all of which are now “back burner” brands of bigger corporations. We saw GM trim the fat in early 2011, ditching Saab, Pontiac, Hummer and Saturn – a great move for the automotive giant. This leaves them with, not including Chevrolet — Buick, Cadillac, and GMC – three brands that will need some quick restructuring if they want to survive. Acura continues to be one of the most boring brands of the past few years. While as reliable as cousin Honda, most of their fleet continues to be overpriced and unappealing. Forbes called the ZDX/Crosstour venture one of the biggest flops of 2011, and the RL and TL sales have slowed to a crawl. The TSX remains popular, as side-step alternative to the Accord, but is still not enough to keep the brand alive. Mitsubishi seems to be another drowning victim, although their decline of sales has tapered off in the last few months. The 4th-generation Eclipse has hit rock bottom, and their lineup of unique but “cheap feeling” SUVs isn’t helping. The recently redesigned Lancer, Galant and Lancer Evolution continue to be Mitsubishi’s best sellers. The Acura ZDX is one of the worst-selling vehicles of 2011 and Acura’s all-time lowest-selling car. Aside from all the statistics, it comes down to the people. And from what we’ve seen, read and heard – they are eager to see what potential the market has in store. It’s interesting; that with all the distrust in the private sector, people are now more confident towards buying homes and cars than they have been in years. This does not show that the economy is at a resolve by any means, but more so that people desire to move their lives forward again. This sort of “networked” confidence is what propels the market in a positive direction. People wonder why auto makers dropped most of their performance vehicles several years back, and it was due to nothing more than a lack of this type of confidence and demand in that area of the market. Though the base for performance vehicles and tuning is huge, we have to realize that it’s still a very small percentage of the global market. A manufacturer’s primary interest is the general consumer, who — by today’s standards — is primarily interested in energy-efficient and reliable transportation. But it begs the questions – how is the general consumer market connected to the tuning/aftermarket industry? They’re connected in a big way. A good platform will get performance vendors excited enough to start R&D. The better the R&D and the more aftermarket support available for a car, the more popular it may be. Don’t believe me? Look at how many Honda Civics you see out there with performance parts on them. Great aftermarket support means a stronger following from the performance enthusiasts. We saw many examples of this at the 2011 SEMA Show, where aftermarket parts vendors meet and show off their latest products. Eibach, based in southern California, has one of the most in-depth and localized R&D programs. They are constantly looking to design and test new suspension components for muscle, import and luxury cars alike. DC Sports has been on the move, creating new intake, exhaust and tuning solutions for California-emission controlled street vehicles. Bisimoto Engineering isn’t a huge company, but they are widely known in the Honda scene to push the limits of power via extensive testing and fine product craftsmanship. Mishimoto is the latest provider of affordable cooling equipment, from quality aluminum-core radiators to feeder lines, thermostats, fans and more. Their S13 project has been around for a while, but it was neat getting to see it for the first time. Overall, SEMA was a pretty eye-opening experience. Neither of us had been for before, and I was blown away by the sheer amount of booths and floor space to walk. It was probably my favorite event of the year, followed closely by the Coronado Speed Festival. Those are the two events I simply can’t wait for next year. As for us, well, we’re going to keep on doing our coverage throughout 2012, but we’re also aiming to give you guys some different and exclusive content to look at, rather than just our take on an event you probably saw at ten other sites prior to ours. Tim will elaborate on our plans for 2012 in the coming days. I have been glancing over some of the recent statistics and they look great. We’ve doubled our pageviews since 2010 and that number is growing each and every day. Our Facebook page, which is also steadily growing in “Likes”, has sort of become a portal to our day-to-day content and commentary, while we continue put our more formal editorials on the site. Facebook has helped us tremendously; it allows us to connect with our followers, network with other sites, and share the unique content we find. We’re always keeping an eye on it, so feel free to post up what you do/don’t like and give us your feedback. Ultimately, our goal is to bring you more of what you guys want to see featured here on the page and attain your patronage that way. With that being said, we will see where 2012 takes us. We are definitely excited – we know there will be more significant changes, great new builds, and more opportunities for us to grow within the community. Thank you for your continued support! (C) 2011 FORD MOTOR CO.